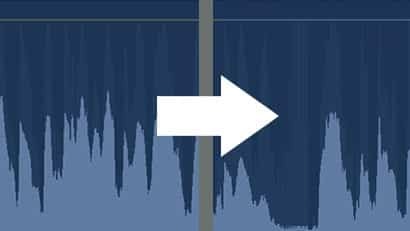 Automatically remove hiss and background noise from your audio – right inside FCPX, Premiere Pro, Logic X, Garageband and Audition. If your video has noisy audio, it makes your project look bad. A hiss in the background is distracting and it instantly makes your video look amateurish. AudioDenoise™ by CrumplePop actually removes this noise from your audio, leaving you with a clean, polished sound. It seems like magic, but the secret is the powerful noise removal algorithm at the heart of AudioDenoise™, designed specifically for video editors. AudioDenoise™ works automatically - there is no need to painstakingly select noise regions first. AudioDenoise™ analyses the audio in your video, identifies the unwanted noise, and removes it. We know that as a video editor, the last thing you want to do is spend hours tweaking your audio. AudioDenoise™ is such useful plugin, and is applicable to so many video projects, that we think you will be amazed at how often you use it. AudioDenoise™ is a very simple plugin. You just drag it onto your audio, and it instantly removes background hiss. There is exactly one control - a "Strength" slider that lets you fine-tune. That's it. AudioDenoise™ is designed for video editors, not sound technicians. To see how use AudioDenoise in Final Cut Pro X, check out this brief video. To see how use AudioDenoise in Premiere Pro, check out this brief video.